Honourable Julian Fraser RA, (left, Photo: VINO/File) and Speaker of the House of Assembly Ingrid A. Moses-Scatliffe (Photo: VINO/File) clashed at the seventh sitting of the second session of the House of Assembly held on April 4, 2013 over the omission of many topical questions submitted by the Opposition member. The Speaker told the public that she had given Hon. Fraser the reasons why they were not included. Hon. Fraser said he disagreed with her reasoning. This was not to be, however, as Premier and Minister of Finance Dr The Hon. 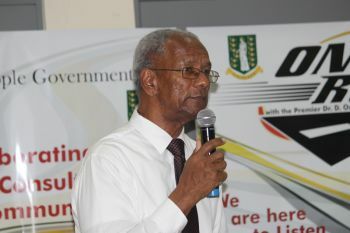 D. Orlando Smith effectively shot down a series of nine (9) questions related to the Cruise Pier project asked by Hon. Fraser. Premier Smith told the House of Assembly that the questions being asked could not be answered as a result of “ongoing negotiations” about the subject; as a result of this he stated, it was his opinion that publication of the information would be “contrary to the public interest”. 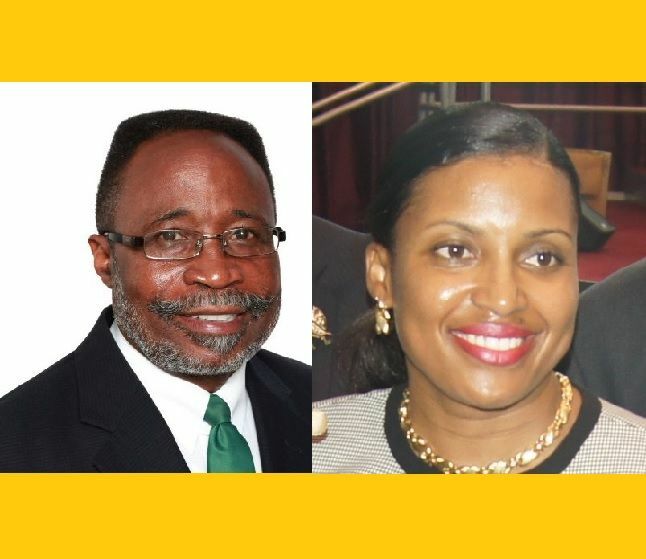 He gave the same response as the reason for not answering any of the questions, including one which asked whether a contract had been awarded by the government to Tortola Port Partners Limited for the Tortola Cruise Pier and Park project. Hon. Fraser’s questions removed from HOA Order Paper unearthed! ROAD TOWN, Tortola, VI- Many persons tuning into the seventh sitting of the second session of the second House of Assembly (HOA) on April 4, 2013 would have witnessed the heated exchange between veteran Third District Representative Honourable Julian Fraser RA, and Speaker of the HOA Honourable Ingrid A. Moses-Scatliffe. The debate was over questions proposed by Hon. Fraser but never made it to the Order Paper for yesterday’s sitting. The Member further stated that a question directed to the Minister for Communications and Works, Hon. Mark H. Vanterpool was also omitted. He then indicated to the Speaker, “given that those were very important questions” he would be most pleased if he could be assisted in avoiding a similar pitfall in the future by being enlightened about the line of thought involved. Hon. Fraser also mentioned that while on the streets he was told by a lady of the conversation he had with the Speaker. It’s unclear how this information may have reached out on the streets. Through our own investigations and information obtained by this news site and sources close to the situation, we were able to unearth a copy of the questions that would have been asked by Hon. Fraser, if they were allowed to make the Order Paper for the April 4, 2013 Sitting of Parliament. a. The company with the winning bid on the expansion of the cruise pier and the development of the adjacent property at Wickhams Cay I, has any Belonger interest in its ownership? c. Is the company with the winning bid in partnership with any local companies, if yes, which company is it, and what percentage is such partnership? a. The Heads of Understanding dated March 27th 2012 signed and entered into between Tortola Port Partners Limited, as the Developer, and The Government of the Virgin Islands, wherein the parties agreed to “work closely together exclusively and as far as commercially reasonable to cooperate fully with each other in relation to negotiating and finalizing such Documents as they deem necessary for the advancement of their intended project within ninety (90) days from the date of this HOU, subject to the approval of a Trade License for the Developer”, was disclosed by the Government as part of, or made public for the benefit of other competing entities in the Public Tender of the Tortola Pier and Park project? c. Was a Trade License issued to Tortola Port Partners Limited for the purpose indicated in a) above? Madam Speaker, could the Hon. Premier and Minister of Finance please provide this Hon. House with a copy of the document referred to as “The Working Memorandum” referred to in the document Heads of Understanding dated March 27th 2012 between Tortola Port Partners Limited, as Developer, and the Government of the Virgin Islands. b. If any such, Agreements, Memoranda, or Heads of Understanding exists, can the Hon. Premier and Minister of Finance please provide this Honourable House with copies? a. 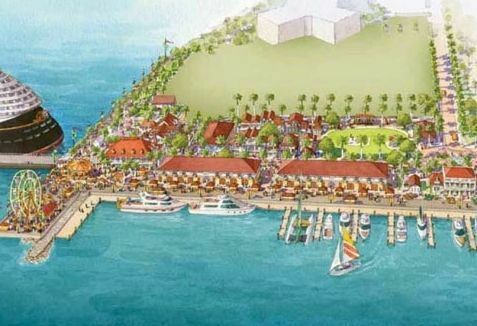 It was a condition of the tender process for the development of the Tortola Cruise Pier and Park for each Tenderer to demonstrate and establish that they have at least a twenty percent (20%) local ownership partner participation in the project? b. If the answer to a) is no, was the requirement established during the subsequent proposal and negotiating process? d. If the answer to a) and b) is no, did any of the Tenderers produced in their Tenders such local partnership, and which ones? a. The Auditor General has issued a report regarding the Tortola Cruise Pier and Park project, including any aspect of it or the internal public service process relating thereto? c. Can the Hon. Premier and Minister of Finance please provide this Honourable House with copies of the reports? Madam Speaker, could the Hon. Premier and Minister of Finance please tell this Hon. House whether it is his Government’s intention to fund wholly or in part, the Tortola Cruise Pier and Park project development by way of raising passenger tax on cruse passenger? a. He is aware, that Royal Caribbean Cruises Ltd (RCCL), one of the prime Tenderers on the Tortola Cruise Pier and Park project, has formally expressed to the Government of the United Kingdom their dissatisfaction with the entire Tender and negotiation process, on the grounds that it failed to conform to minimum standards that typically are present in a genuine government privatisation tender? b. If the answer to a) is yes, how does he propose to mitigate any resulting falling out with the United Kingdom Government? a. The tender instructions for the Tortola Cruise Pier and Park project failed to outline the specific criteria used to evaluate and score the bid proposals. c. They were not allowed to discuss their project ideas with government officials or obtain clarification of various questions about the bid. Which was not the case with their competition who had freely interfaced with the same government officials extensively for the previous nine months? e. That they considered the attitude of the same Mr. Cline and some of his committee members towards their group as antagonistic, attacking, aggressive, patronizing and unfriendly. And that their attorneys were no different. Up to press time, both the Speaker of the House Hon. Moses-Scatliffe and Opposition member Hon. Fraser could not be reached for comments. Some serious questions I could now understand why the speaker wanted them off the order paper…she must protect the government that give her the post!!!! The fact that these very pertinent questions were removed speaks volumes both about both the speaker and the house in general. These are the same questions the public has been (repetedly) asking, yet to date, have gone unanswered. I guess we know where allegiances lie! LOL.. so true. I wonder how they feelin now that the shoe is on the other foot. Frazer real smart, must have a law degree asking these questions. I am not going to be bothered by her ramblings. You should be stoned for your utter contempt for the English Language!!! thanks for your very informative comment...??? Do we expect Ms. Moses to go against their own mandate? DONT WORRY SHE WILL BE RUNNING FOR THE SIX NEXT ELECTION AGAIST THE BAG LADY JUST TURST ME ON THAT. THE BAG LADY CANT TOUCH THE SPEAKER. THIS FROM VOTER FROM THE SIX. IM A VIP BUT I WILL BE VOTING MADAME SPEAKER LADY INGRID MOSES. OJ go fly a kite. This speaker is real jokey lady!!!! You are a fool, Fraser is not trying to fool anyone he is brining the issues out there. that wutlissness and disgraceful nastiness who is the sp.... needs to be fired, where in the world would you hear that but remeber Inez did that to the VIP during her speaker reign from 2003-2007. The NDP does not care about VI they care about themselves and it is obvious, those questions were not bad. Fraser is the only one looking out for us in the 3rd... bull pup aint going to do that. so you need to shut it, and talk what you know. Fool Fool Fool the NDP has fooled you! @wellsa2.. Who is bull pup? For the life of me, I can not see the logic for the Speaker getting so wrap up in the corup dealing of this NDP Gowerment. This woman has very bright future, why she throwing it away? She is a lawyer, she could distroy her success like the other Woman Speaker who nobody want to see, but she old and dont care. This girl young, she could be the next 6th District Rep. but at this rate that aint going happen. mmm hmmm' How much are you been paid for this blog? Breaking News, they say, the question here is for who? You dont need a law degree to ask pertinent questions. Just common sense. That's applied when the law dont speak. not to ask questions I agree, but to ask the questions as drafted, that is altogether a different story. Hummm I guess you are saying they are just like the VIP then. I am shocked but not really surprised at this story. I keep hoping there are sincere people who will dig at the truth. I am not a fan of Fraser's by any means. And for all we know, he has vested interest in royal Caribbean himself- HOWEVER- these are important basic questions which should be answered. EVERYONE wants to know who are members of TPP and who is involved... this is not governing in the sunshine.. and now Cline is director of port authority. Insider information... I hope this development gets revisited soon. UK- stop it now to get more answers. thanks Mr. Fraser; Lights on, but no one's home!. The Speaker said she advised Fraser of the removal of the questions within reason. What was/were the reason(s) given? I think that should be mentioned so we have a better understanding of why the questions were removed. The Speaker is not stupid so there must be a reason for the removal. Let's hear the whole story. When the nation is asking the government Questions and you all are silent , You all now know how the nation feels, trust me " Everything in the darkness will come to light" . Incomplete final question: 'who got paid and promises from the port deal??? How will the truth be known if the Speaker is blocking? So wait these NDP cowbirds don't understand the island man term; shew fly doh bother me. WAIT.!!. Whom the gods would destroy they first make mad with power. Doh worry, there are a LOT MORE sensible people in this country than that. The media is afraid of the NDP bulldogs and they are not yet doing enough to show up this corrupt NDP govt. Meen understand what all the babbling about. The Speaker is in her rights to take of what questions she feels is not valid. Those same questions were aked time and time before by Frazer and Fahie and answers were given. Shows how much some of us listen to the house. Most of those questions were constructed as implications not questions. She had a right. When that mumu VIP had for a Speaker took off questions NDP had on the order paper back then and refuse to let them argue them in the house, everyone was silent. It was a joke then on NDP how the past speaker handle them. Now NDP is in power and the chosen Speaker must pacify the likes of Frazer with his nonsense. There were times in the house she sided with VIP and made NDP sit down so how can you all place her as being one sided? If some of us would real and understand we would find out all we want to know about the cruize port but we just like to listen to third party talk which is pure gossip and twisting of truth. We dont want to pick through paragraph statements - we want to hear them clearly answered. hope they put them back on the order paper. Whey boy this is the BVI. It is about time.for the Oppersition to put their ducks in order. GoonSquad is a duncey teacher and blogger? And what can I say about you Pink? That you are double sided because you went to school in August and don tknow the difference between Male & Female. i agree 100% with Mr. Fraser these vital questions should have been allowed. The ball's in your court, Madam Speaker. And please, don't tell us to move on!!!!!!!! What is so amazing is when the shoe w on the other foot, I never saw any blogs cursing out the VIP and their Speakers (Flax and that other one from VG). They never give NDP a chance to voice their objection. The did the same as this present speaker. Took questions off the agender. Yes it was their rights according to laws so why is it wrong for her to do the same? She holds the same position as Speaker. I blame NDP for they never came to the house or let us know when things like this happen to them. The continue to pacify the other side and they always come back to cut their B side. I am truly surprised at some of these comments against one of our own. No wonder we are stuck in this rut we are in. Some of us fight and try to up lift our people and the others tearing them down. When will this nonsense stop? There are bigger problems we should be talking about like the appointment of an expat as accountant general (that is problem) but we choose to over look that and brig down one of our own..Only God can help us and if we dont hear from him, we will self destruct as a people. Princess. It is fine for you to claim "CLAIM" that the VIP Speakers did it so why the fuss when NDP Speakers do the same thing, but can you give an instance? The Standard Orders is clear on what should no be in a question. Speakers should be free of politics. You should ask the speaker to tell us the exact chapter or sub chapter the member questions violated? Was the issue with the Port Pier Project Tendering in the Court? Was it in a Committee? Is it a secret? Tell the speaker stop playing politics. And you should see that this is wrong. And to say there are things bigger than this to worry about, is like playing god, trying to tell us what is important to us. I was particularly pleased with the line of questions Hon. Frazer...you on to something!!!! Good governance does not only apply to a few but all people!! Ingrid is physically a small person, but she does have an aggressive personality for a lady!!!! I was amazed to see that in a so call democracy this kind of oppressive behavior is allowed by the Speaker in our legislative council. The BVI is for sure gone to the dogs. They want to shut down the media houses, now they even want to shut down the opposition what is wrong with my country???? what this women Ingrid did to we the people it's scary! What answers do any of you have to help solve the bigger question: How are we as a people going to chart the course of this country. Whether VIP or NDP, the gong will drop on all of us when the British highhandedly plan to lynch us. People keep your eyes on the issues. These nit-picking is pitting us against each other. At the end of the day, we need all Virgin Islanders to come together to save our country our forefathers gave us. The Speaker is guided by Standing Orders which she has complied with. Get it, people, she is within her right to do what she did. We sound like a bunch of haters of each others and totally divided. Many are shouting abuses at each other rather than speaking to the subject matter. Wake up, people. Yes the Speaker has the right to withhold an item from going on the Order Paper, but only if she feels it violates any of the Standing Orders Provisions. Let he tell us which Standing Order Provision those questions violated. She can't because politics is not a Provison of the Standing Orders, and it was Politics she took it off for. To CYNDPA. That's to cover the NDP A. He will have to answer to us in 2015. As a member of this community, I want to know about the cruise ship pier park, it's cost, who are the TPP members, have all the design details been finalized, Height, scale, design itself, questions about traffic, pedestrian, infrastructure, sewage, electricity, where are mechanics going so they are not noisy, merchant space at the pier, etc. 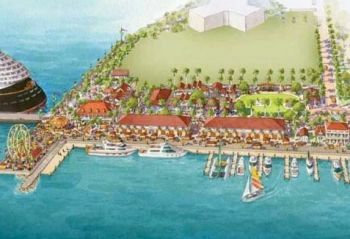 This is a development that will change the character of Road Town and BVI forever as the front door for cruise ships. Has a study been done about how passengers spend, move around, how many come off the ship, how many tour- and as seen in Jamaica- how many local vendors get bypassed?. This can NOT be done quickly and with ego or self-involvement or hidden agenda. How is this going to be funded? costs etc. where is town and country or even planning and ports authorities on this other than being "yes" men to the government? Fraser is not my favorite person and when the shoe was on the other foot, he played as many games. But this all has GOT to stop and become responsible planning and development or we all lose.